CAPE CANAVERAL, Fla. - Atlantis and four astronauts returned from the International Space Station in triumph Thursday, bringing an end to NASA's 30-year shuttle journey with one last, rousing touchdown that drew cheers and tears. "We each got choked up at different times," crew member Rex Walheim told reporters at a post-landing press conference. "There were times that you would take in the big picture, and it would get to you." Coming home to a future clouded by tight budgets and uncertain political support, commander Christopher Ferguson guided Atlantis through a sweeping left overhead turn and lined up on runway 15, quickly descending into the glare of powerful xenon spotlights, CBS News space analyst William Harwood reports. Approaching the 3-mile-long runway, Ferguson pulled the shuttle's nose up in a graceful flare, co-pilot Douglas Hurley lowered the ship's landing gear and Atlantis settled to a tire-smoking touchdown at 5:57 a.m. Eastern time. A few seconds later, as Atlantis barreled down the runway at more than 200 miles per hour, Hurley deployed a red-and-white braking parachute and the shuttle's nose gear settled to the runway. Thousands gathered near the landing strip and packed Kennedy Space Center, and countless others watched from afar, as NASA's longest-running spaceflight program came to a close. 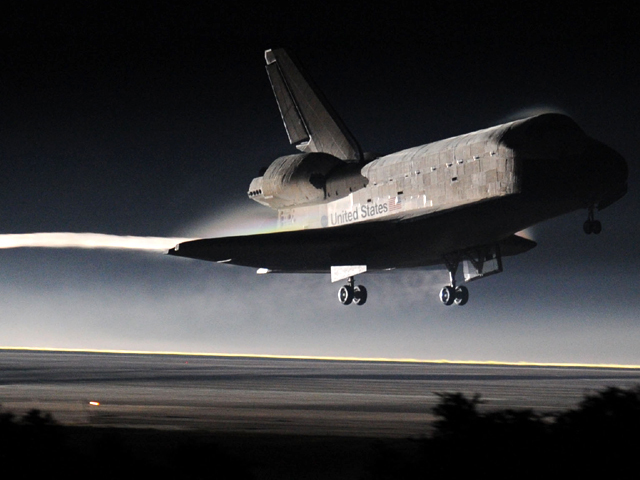 "After serving the world for over 30 years, the space shuttle's earned its place in history. And it's come to a final stop," Ferguson radioed after a ghostlike Atlantis glided through the twilight. Harwood has covered the space program for CBS News for 20 years. "It's almost like a funeral," Harwood told CBS News correspondent Rebecca Jarvis from Kennedy Space Center on CBS' "The Early Show." "I hate to put it that way, but it's almost like the loss of a good friend for all the thousands of people that have worked on the space shuttle over the last three decades. Seeing it come down to this landing and close out the program is truly a bittersweet moment." With the shuttle's end, it will be another three to five years at best before Americans are launched again from U.S. soil, with private companies gearing up to seize the Earth-to-orbit-and-back baton from NASA. Until then, NASA astronauts will continue to hitch rides to the space station on Russian Soyuz spacecraft  for around $60 million per seat, Harwood reports. "That's something that simply doesn't sit very well among the men and women who care and feed the shuttle over all of these years," Harwood told Jarvis. "There's some real disappointment about that more than the fact that the shuttle itself is over." Thursday, though, belonged to Atlantis and its crew: Ferguson, Hurley, Rex Walheim and Sandra Magnus, who completed a successful space station resupply mission. For the landing, there wasn't nearly the hoopla that surrounded Atlantis' launch on July 8  when an estimated 1 million packed the Cape Canaveral area  because of the hour and lack of spectacle. The darkness robbed virtually all views of the approaching shuttle, and made it more of a NASA family affair. Atlantis was greeted with cheers, whistles and shouts from the record 2,000 who had gathered near the runway  astronauts' families and friends, as well as shuttle managers and NASA brass. Soon, the sun was up and provided a splendid view. Within an hour, Ferguson and his crew were out on the runway and swarmed by well-wishers. At those words, dozens of past and present flight controllers quickly streamed into the room, embracing one another and snapping pictures while keeping their tears, if not their emotions, in check. But on the landing strip in Florida, flight director Mike Leinbach said the tears flowed. He himself was awash with emotion as he took in "the beauty of the vehicle," snapped pictures and posed for pictures at workers' requests, some of whom face layoffs. "I saw grown men and grown women crying today  tears of joy to be sure," Leinbach told reporters. "Human emotions came out on the runway today, and you couldn't suppress them." Atlantis  the last of NASA's three surviving shuttles to retire  performed as admirably during descent as it did throughout the 13-day flight. A full year's worth of food and other supplies were dropped off at the space station, just in case the upcoming commercial deliveries get delayed. The international partners  Russia, Europe, Japan  will carry the load in the meantime. It was the 135th mission for the space shuttle fleet, which altogether flew 542 million miles and circled Earth 21,152 times over the past three decades. The five shuttles carried 355 people from 16 countries and, altogether, spent 1,333 days in space  almost four years. Two of the shuttles  Challenger and Columbia  were destroyed, one at launch, the other during the ride home. Fourteen lives were lost. Yet each time, the shuttle program persevered and came back to fly again. The decision to cease shuttle flight was made seven years ago, barely a year after the Columbia tragedy. President Obama nixed President George W. Bush's lunar goals, however, opting instead for astronaut expeditions to an asteroid and Mars. NASA is sacrificing the shuttles, according to the program manager, so it can get out of low-Earth orbit and get to points beyond. The first stop under Mr. Obama's plan is an asteroid by 2025; next comes Mars in the mid-2030s. An American flag that flew on the first shuttle flight and returned to orbit aboard Atlantis, is now at the space station. The first company to get astronauts there will claim the flag as a prize. The space station, orbiting nearly 250 miles up, was visible from the launch site just before Atlantis returned. NASA's challenge, said space operations chief Bill Gerstenmaier, is "how do you make that little white dot real, that's as exciting as a launch ... or the landing that you saw nine minutes later?" Thousands of layoffs are coming as early as Friday  on top of thousands of shuttle jobs already lost. As a thank you, NASA parked Atlantis outside its hangar, so workers could gather round and say goodbye to one another. Hundreds gathered in the heat, waving U.S. flags and paper fans, and photographing the shuttle as music boomed from speakers. "My job disappears but I'm looking for the next adventure," said Glen Longwood, who's worked at shuttle emergency landing sites overseas. After months of decommissioning, Atlantis will be placed on public display at the Kennedy Space Center Visitors Complex; its debut is targeted for summer 2013. Discovery, the first to retire in March, will head to a Smithsonian hangar in Virginia. Endeavour, which returned from the space station on June 1, will go to the California Science Center in Los Angeles. "I want that picture of a young 6-year-old boy looking up at a space shuttle in a museum and saying, 'Daddy, I want to do something like that when I grow up.'"